Trimming your lawn is like putting the icing on the cake—not required, but it adds so much to that manicured touch. To some, trimming is an extravagance and needless extra effort and expense. Yet to others, the lawn just isn't finished unless it's been trimmed. I personnally like the trimmed look to a certain extent. I will do a complete trimming about every 3 - 4 mowings. I will only do an edging about three times during the year. What's the difference between edging and trimming? Edging is a vertical cut and trimming is a horizontal cut. Both use different pieces of equipment or attachments. Trimmers are usually done with heavy nylon string that rotates in a circular motion, parallel to the ground. 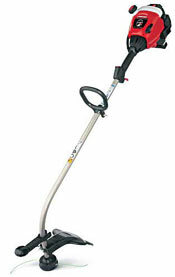 Edgers usually have a short metal blade similar to a lawn mower blade, but is positioned perpendicular to the ground. Trimming and edging your lawn is usually not as glamorous as say mowing— but then what is? However, the difference between a good lawn and a great lawn may only be a trimming or edging away. Electric corded trimmers. If you have a small yard with thin grass, electric models are a good value. Beautify your property quickly and easily, with no hassle. Electric and cordless trimmers are lightweight and easy to use. Perfect for those with smaller yards or light weeds! You shouldn’t expect performance to match that of gas trimmers. A good rule of thumb to use for electrical models: if you can reach any corner of your yard within 100' - 150' of an electrical outlet on your house, then you may want to consider an electrical model. They often cost less than half of gas powered models, are somewhat quieter, and require less maintenance than gas powered versions. Cordless electric trimmer. Experts say most cordless trimmers are underpowered, and that you pay extra for the convenience of losing the cord. You'll only get about 30 minutes of runtime from the battery, but if you have a small yard and don't need to clear brush, tall grass, or weeds, a cordless trimmer is a good choice for trimming thin grass. 4-Cycle trimmers. 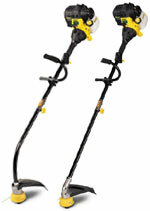 4-Cycle trimmers are the big boys on the block. They're an excellent, clean-running choice for those with large or extended trimming jobs and/or commercial applications. Plus, with no oil and gas mixing, 30% more fuel effeciency, and more torque, they are dependable and powerful for any job. They run cleaner, somewhat quieter and meet EPA and CARB emission standards. Straight or curved shaft handles? While experts say curved-shaft models are easier to handle, some professionals prefer straight-shaft models for their longer reach and ability to accept accessory cutting heads which is different than being able to accept optional attachments. Pole saw, hedge trimmer, and bicycle handles are also available on several models for added versatility. Many strim trimmers can add an edger attachment, as well as tilling attachments. When buying a gas-powered trimmers or edgers, costs range from about $80 up to $300. Electric models run from $40 - $90. Conversely, if you have a larger yard with areas that are in excess of 100' - 150' away from your electrical outlets, then gas powered trimmers may be your best bet. Additionally, gas powered trimmers are much more mobile then the electrical versions and can be carried and transported with every little time and effort. Keep in mind that the gas powered versions also run two-stroke engines and frequently require gas/oil mixing and additional maintenance. Obviously buying both a trimmer and edger for a lawn of less than an acre in size may seem like a lot of money. For most people, spending around $200 for one of these machines is the limit. But there may be a solution. Many horizontal trimmers can be turned to cut vertically as well (for edging). Horizontal trimmers can do a very good job of edging as well. Although they may not look as sharp as a true edger, they can usually do the job and save you money at the same time. 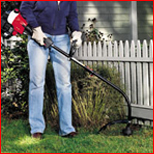 If this sounds desirable, simply ask if the trimmer you are buying can do vertical edging. Sometimes the trimmer boxes will tell you this before you have to ask for help. ADVICE: Strongly suggest wearing hearing protection when operating equipment producing noise of 85 dBA or more, a level exceeded by most lawn mowers and gas powered-trimmers.